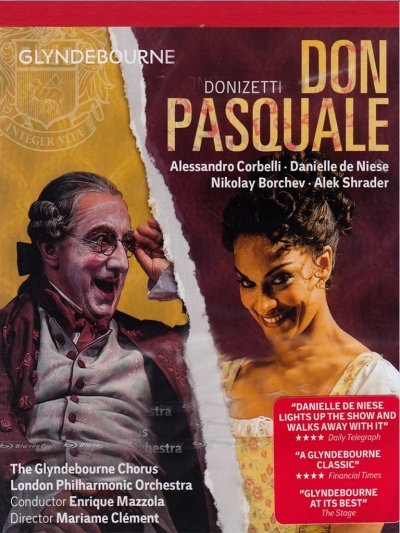 One of the reasons why Donizetti’s Don Pasquale is regarded as a cornerstone of the Italian comic opera tradition is because its characters are no mere commedia dell’arte stereotypes, but complex, vulnerable human beings. This is brought to the fore in Mariame Clément’s sensitive and perceptive production, which was hailed by the Financial Times as a ‘Glyndebourne classic’. Acclaimed buffo baritone Alessandro Corbelli sings the title role ‘with just the right degree of lugubriousness’, while Danielle de Niese, one of today’s most sought-after sopranos, is an ‘engaging’ and ‘irrestible’ Norina (The Telegraph). Bel canto specialist Enrique Mazzola conducts with flair and panache. Extra features: Behind the Curtain, Danielle de Niese introduction, Staging the Opera and a cast gallery.